8 Savoury Foods You Must Try in Kraków! 8 Savoury Foods You Must Try in Kraków! 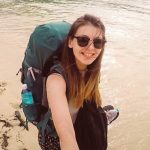 Following my first article from the series: 5 reasons why visiting Kraków is a good idea – I decided to follow up with… food. Yes. Because we all (or most of us) love food. 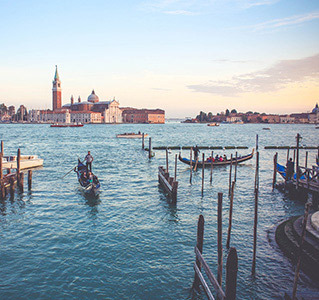 And visiting a new destination without tasting the best local dishes is just a no-no! Polish dishes might not always look Instagram worthy, but all of the love and care goes towards the taste of each cooked meal. Try to eat at more local places – and you’ll be blown away with the variety of tastes that have been carefully cooked to perfection, the traditional way. This is all about savoury foods, but keep your eyes out if you have a sweet tooth as that will be coming out soon too! 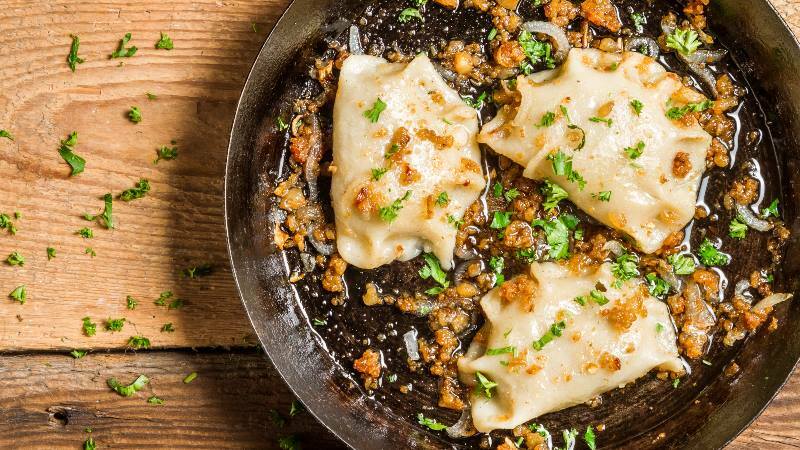 Pierogi are dumplings with many (hundreds) of fillings to choose from, the most popular ones are: sauerkraut with mushrooms, forcemeat, mushrooms with cabbage or potato & cheese – my favourite. But let me reassure you that the list is endless. You can also go for sweet flavours such as blueberries or strawberries filled with the traditional curd cheese (or without). Now, the curd cheese might not sound great – but it’s heaven. A traditional Polish soup made of soured rye flour. There are many ways of preparing Żurek and depending on where you are in Poland – the taste will be slightly if not significantly different. It can be light and delicate or very hearty, with chunks of sausages and potatoes, some also come with boiled egg. If you’re lucky, sometimes it’s served in an edible bowl aka bread. So delicious. And remember – it tastes a lot better than it looks! This is the main ‘side’ dish you can find at the shot bars (more on this in the near future). 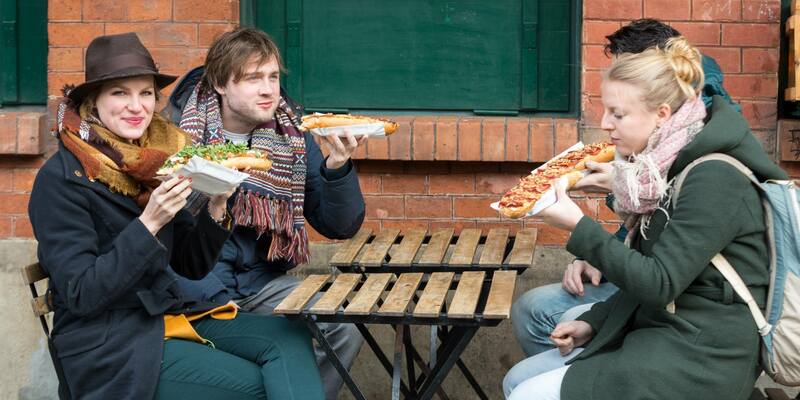 A street snack rather than a full on dish, it’s great to grab on the go while exploring. You will probably read everywhere, that they are a must try. A simple half baguette with mushrooms, cheese and any additional topping. You will be able to see a number of stands saying ‘Zapiekanki’ on them pretty much wherever you go in the centre. The best ones are in the Jewish District – The New Square where you will see a round building in the middle. Kiełbasa aka Polish sausages are the ones to try, if you’re a meat eater. They are traditionally served with fried onions and are especially great from the barbeque if you’re lucky to find one somewhere (or join someone’s garden party ha). The honky sausages taste completely different to the British ones and are an absolute must try. It’s also simply a staple of Polish cuisine, whether as a snack or as a meal. 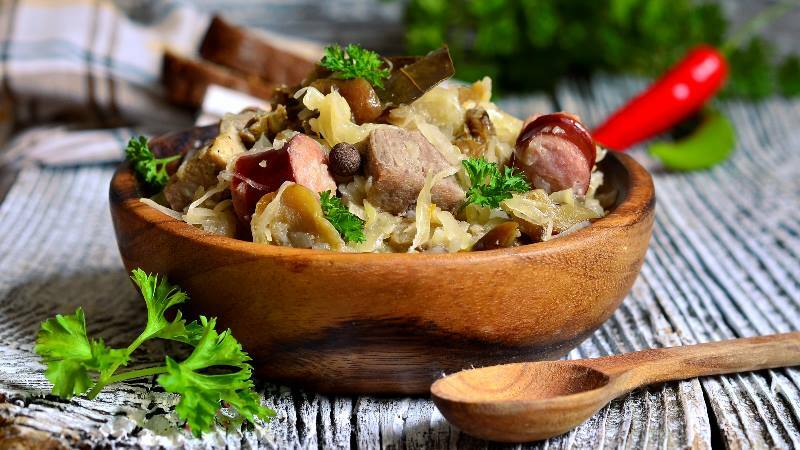 Called the national dish of Poland – Polish Hunter’s Stew is a hearty cabbage and pork (or wild game) based stew. Traditionally it should be cooked for many hours or even days, and this is when it tastes the best. Again, depending on where in Poland you are – it might taste slightly different, but it’ll always be delicious. This is a great dish for cold winters or to experience the true taste of Polish cooking. My absolute favourite Polish soup. Bare in mind, it does sound weird, but when prepared well – it’s next level deliciousness. For real. Barszcz Czerwony = beetroot soup. But stay with me! And remember that beetroots are also super healthy! Anyway, it’s of course made from beetroots, it’s thickened with sour cream and served with chunks of bread. And did I say it’s pure deliciousness? Note, that there are two types of barszcz – one that you eat and one that you mostly drink during the Christmas season or have with mushroom dumplings. 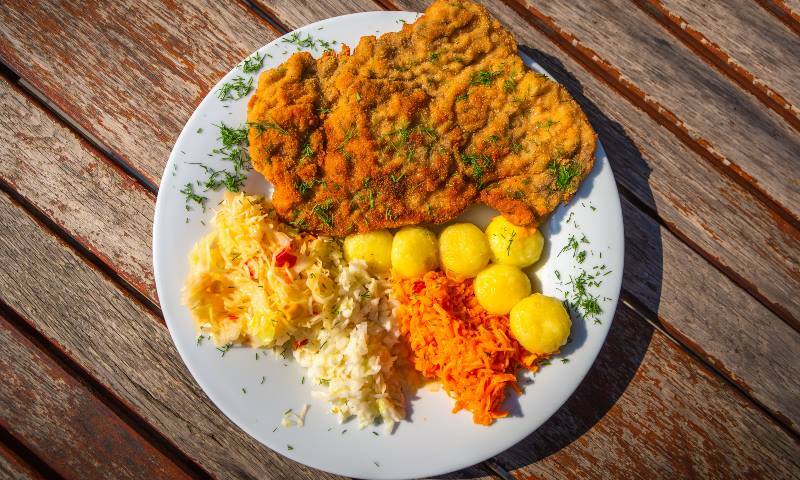 Kotlet Schabowy is a pork schnitzel dipped in egg and flour and coated in breadcrumbs. Again, if you’re a meat eater – this is often a favourite dish, both between the locals and tourists. It’s also a very ‘safe’ option if you’re a fussy eater. Kotlet schabowy is usually served with creamy mash or new potatoes, which for some reason taste completely different in Poland and are so good(! ), plus salads or dill pickle. If you’re lucky – it might come with mizeria – a Polish salad consisting of super thin slices of fresh cucumber with sour cream. Again, my favourite. Last but not least – Pickled cucumbers (ogórki kiszone). Now before you think it’s nothing special, trust me – it is. For some reason the polish version tastes very different and many of my non-polish friends are absolutely in love with them, including myself. They’re a very popular snack when drinking at parties etc, or even during the day or as a side dish/salad with dinners. You’ll be able to literally ask for one (or more) at most restaurants as well as adding them to zapiekanka or many other dishes. So here you go! Plenty of savoury foods to get your teeth into! Enjoy the deliciousness!